Join us for the 35th Annual Meeting of The Canadian Biomaterials Society ! It is our great pleasure to invite you to attend the 35th Canadian Biomaterials Society Annual Meeting, that will be held in Québec City at the Loews Le Concorde Hotel, downtown, from May 21-24, 2019. We are organising this conference to be an experience. While targeting the highest scientific and technical level, as usual, a warm and friendly networking experience will be present. It is now time to prepare your abstract! Please find Topics and Abstract submission guidelines on the CBS2019 website. The abstract submission deadline is February 22, 2019! We are pleased to welcome Catherine Le Visage (Université de Nantes, France) and Ketul Popat (Colorado State University, United States) as Plenary Speakers and Chris Yip(University of Toronto, Canada) as Special Lecture. Their Biosketch and Presentation's Title as well as the list of all Invited Speakers are available here! We invite you to explore our website to get more information about the event! In particular please check the amazing list of Tutorials here. This includes Tutorials on Survival skills for young scientists, 3D Printing, Biotechnology in Biomaterials, Imaging for Biomaterials, Techniques for Tissue Engineering, and Industrial Entrepreneurship in Biomaterials. We look forward to welcoming you in the beautiful city of Québec soon! 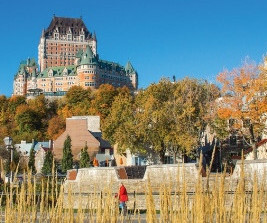 Québec City, its World UNESCO Heritage and its unique atmosphere is the ideal place fo supporting a Canadian meeting where the early Canadian history meets the most innovative and futuristic advances. This unique ambiance will be the ideal environment-fostering meeting, environment-fostering meeting, enjoying, sharing and networking. Copyright © 2019 Conférium, All rights reserved.